Housed in the sump pit, this pump is usually placed in a corner of the basement. The pit or tank is connected to a groundwater collection system, which either draws groundwater from the soil surrounding the structure or absorbs it from the terrain. A pressure sensor or float activator supports the automatic operation of most sump pumps. Basement waterproofing requires more than adequate insulation and sealing. The sole job of this pump is to move water out of a pit or tank and away from the building. First, groundwater must be effectively collected. A drain rock and drain tile are installed along the foundation. The tile serves the duty of carrying water to the sump tank that is in the basement floor. Submersible pumps: Submerged in the water and contained in a waterproof housing, the device sits at the bottom of the tank. Its outlet pipe is above while the bottom of the device has a flat screen or grate to block debris. Water or moisture is drawn through the grating at the bottom and routed to the outlet pipe. Pedestal pumps: These are long posts, topped by the pump itself. The pumping device is kept above the water line by the pedestal. When water fills the sump pit, it is drawn out by the inlet pipe, which extends down into the tank. This is generally a less expensive solution, although the noise from the motor and pump is typically more noticeable since these are outside the water. Either type of pump automatically activates when a buoyant float or switching device is triggered. Both are also about 2½ to 3 feet high and are placed in a pit or space about 2 feet deep and 18 inches wide. Once the water in the tank returns to a pre-set level, the motor connected to the system shuts off, deactivating the pump. Where the water is discharged depends on local building codes. A hose may just transport water as far away from the house as possible. 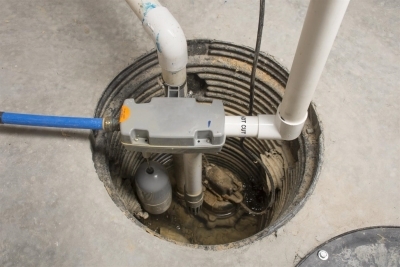 Sump pumps connected to sewer lines usually have a check valve or anti-siphon device connected to the discharge pipe. This prevents backflow so water pumped away from the basement doesn’t return and make your basement waterproofing efforts fruitless. Managing the natural flow of water: Gravity draws water naturally to the lowest point of a structure. Whether the flow is from the surrounding terrain or within your house, the pump will remove the excess once it reaches a certain level. Eliminating the need for mold remediation: Once dampness, a leak, or spill take hold, it only takes about 24 to 48 hours for mold to become a problem. 3 By keeping the water out, mold and mildew problems can be prevented. Cleaner interior air: Mold and mildew can create serious indoor air quality problems. Sump pumping systems eliminate the moisture source, thereby preventing the allergies and respiratory conditions that can occur due to extreme and/or prolonged exposure. Continuous protection: You don’t even have to be home for the pump to work. Since it is triggered and turned off automatically, water levels will be managed even when you’re sleeping, at work, or on vacation. 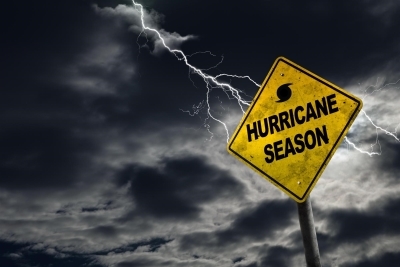 Flood prevention: Sump pumps provide continuous protection against floods. It can cost as much as $10,000, maybe more, to clean up and repair a flood-damaged basement. 4 Installing a sump pump generally costs much less than that. To stay dry: Water is removed as soon as it starts to fill the sump pit and directed by a pipe to the outside. The check valve prevents backflow while a slope that grades away from the house also keeps water out. Mold/mildew prevention: If you don’t like the sight of mold and mildew or have an allergy, the sump system will prevent any aesthetic or health issues as the water needed to support fungal growth is not there. Alerts of high water levels: A higher-end sump system can send cell phone messages if there’s danger of a flood, so homeowners can make a call to their local emergency plumber. Soil stability: Some pumps, especially those used in commercial structures, add to ground and building stability. If an aquifer or naturally occurring water-bearing rock layer is present, this is especially important. Added home value: If you have a pump installed, it can raise property value. 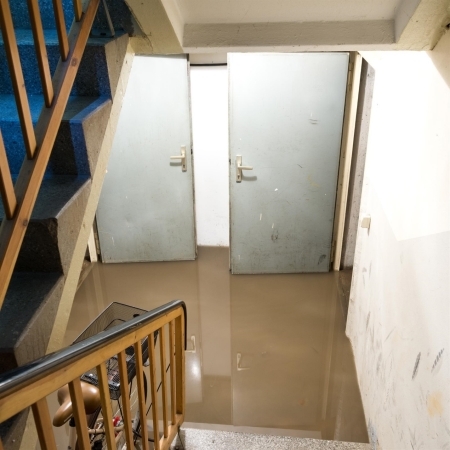 The reason is, a dry basement is more likely free of structural problems and flood damage; potential buyers also don’t have to worry about it easily flooding during a normal rain event. Maintenance is just as important as having a pump installed; otherwise, your need for water restoration services may come into question anyway. If you hear the pump or receive more alerts than usual, the pump may not be as reliable as it should be. Proper maintenance helps it last longer. Conduct periodic checks of the electrical connection, cord, and ground fault circuit interrupter. If the area becomes damp, the circuit breakers can trip and disable the pump, so it’s important to check on this from time to time. Another consideration is the vibration sump pumps naturally produce. This can cause them to tilt or the float arm to jam, so make sure the device is upright. Also, test the automated system periodically by pouring a bucket of water into the pit, to be sure the pump starts and stops as it is designed to, and that the water drains away quickly. Budget Waterproofing Inc. has served customers in the wet basement, waterproofing, and air quality industry for over five decades. The company employs fully licensed, insured, and bonded installation technicians who are trained to use the latest equipment and techniques. Avoiding the need for water cleanup services and mold remediation, they can fully serve all your crawl space and basement waterproofing needs. 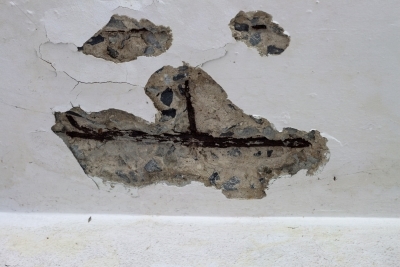 These technicians will do more than shore up cracks in the foundation. They can install fully functional sump systems you can trust because the company has a long history of satisfied customers and has an A+ rating with the Better Business Bureau. In addition, a Lifetime Guarantee is provided on all services, proving how confident the company is in its skills and craftsmanship. Whether you are a new homeowner, have owned a house for years, or have a business in a flood-prone area, you can trust us to install a sump pump and address all waterproofing issues. Contact our team for installation, estimates, and emergency services in the Baltimore area today at (410) 609-1240, or submit an online form for a free estimate.